There she is, folks. That is your first look at the Moto X variant headed to Verizon. No details have accompanied the photo, but we can clearly see Big Red’s “4G LTE” logo in the notification bar, along with a phone design that matches up to previous leaks. 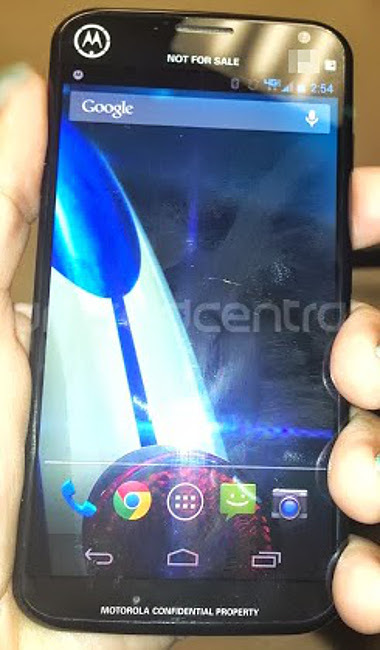 The phone pictured appears to be running stock Android or at least a version that is extremely close to stock Android. We’re looking at the stock icons, coupled with on-screen navigation keys. Most importantly though, the screen takes up almost the entire front of the device and is most definitely edge-to-edge with little chin or forehead. Clearly this is a test device, hence the “MOTOROLA CONFIDENTIAL PROPERTY” and “NOT FOR SALE” tagged across the top and bottom. The circular Motorola logo in the top left is also typically used on test devices rather than retail units. So when this phone launches, it could be almost brand-less outside of the little Motorola batwing that should be inserted into the indention on the back side. And remember, this device won’t be a DROID in the sense that the ULTRA and MAXX will be. This is Motorola and Google’s baby that will be a flagship across all carriers. To catch all of the latest in our most recent recap of the Moto X, you’ll want to check out this post.